4 increases for next week (down from 12 last week). An average increase of 6.1% with only Foot Locker having at least a 10% increase. 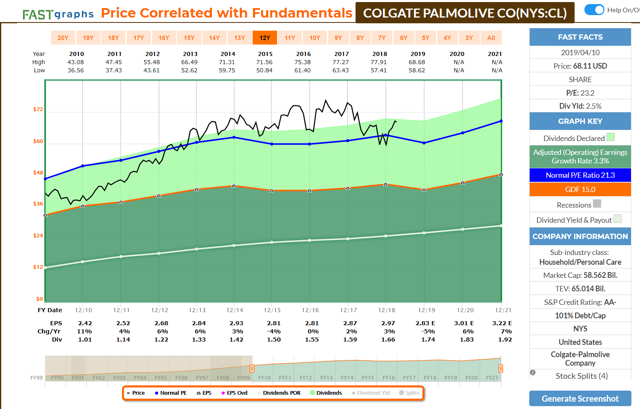 Dividend King Colgate-Palmolive (56+ years) has announced their next increase. I'm a huge fan of dividend growth stocks and hope you are too. If you do, you are in the right place! I've compiled a list of stocks that are increasing their dividends next week. This gives investors an opportunity to start or add to a position to capture an upcoming payment. This can be especially important for retirees who live on dividend checks. A Dividend King always gets the spotlight for a particular week. It is a tremendous accomplishment to have a business relevant for 50+ years coupled with effective management to increasingly reward shareholders year in and out. With no further ado, here is a little more information on Colgate-Palmolive. While shares have an AA- credit rating and the aforementioned 56 years of dividend growth history, shares seem a little stretched here. EPS is expected to decline year over year with them already starting at 23x earnings. When the whole market tanked during Q4 of 2018, shares seemed more reasonably valued when they dipped just under $60. From Simply Safe Dividends, the company sports a reasonably great safety score of 88, but it comes at the expense of growth (35) and current yield (44). 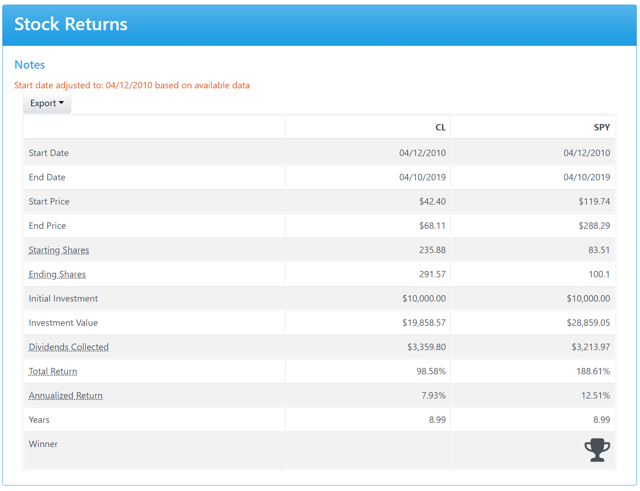 Running a stock return calculation against the S&P (SPY) since April of 2010, CL lagged the market by about 4.5% per year. The raw number doesn't tell the whole story though as the returns offered by the two were closely matched for most of the comparison period until the election in November 2016. That phenomenon is visible on the Fast Graph above if you look near the tail end of 2016. Shares were at a high premium leading up to that point and have struggled since. It shouldn't be surprising given that earnings have not grown and shares trade through a P/E range from about 20 to 26 since.